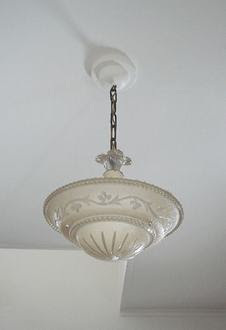 Yesterday I posted photos of my salvaged pink hanging light. It needed a cleaning, paint stripped off the metal (why do people just paint over light bases when they paint their ceilings anyway? ), and new wiring. I took the light apart and started cleaning. Then made a few calls and located a small vintage lamp repair shop called The Lamp Mender (in Bloomington 9911 Lyndale Ave S.) that sold cloth covered wire. I went with the black cloth. I managed to replace the wiring (I think) and add a grounding wire (I think). It took me a long while to see the oh-so-light markings on the cloth that indicated the neutral vs hot wires...and then an equal amount of time to try to figure out which was the "brass" screw on the socket. After stripping the remaining white paint off of the base, I decided to protect the metal with 3-in-One oil. I used the same approach on my kitchen hardware after I cleaned it. I hope that the oil will allow the metal to develop a nice patina.....right now it gives it a nice glow. After some debate, I decided to paint the socket cover. It was originally a very light pink and the paint I used closely matches the original color. I cleaned the chain, but left the patina. For whatever reason, my house attracts pieces with mixed metals - the base on this light is steel, the chain is brass. The next photos of this light you see it will be (hopefully) hanging in my bedroom. It looks a lot more impressive with the pink, three chain, glass shade. Here's this weekend's project. It's a light I purchased salvage a couple of years ago. The shade is spectacular. The base, not so much. This is one of those tiny projects that gets started and then put aside when bigger things come up (you've probably seen me post about it before). The plan is to get the remaining paint off of the base and get some type of protective coat on the metal (you can see fine rusting - I've got a few ideas on this). The little stem piece is a very light pink. I can't decide whether to repaint it or not. A while back I thought I would clean it up and leave it "as is." I generally take the "unless there's a problem, leave well enough alone" approach.....but, I'm wafffling. I did find a tester of paint in the same color. We'll see. The chain needs to be cleaned & polished. The little glass flute also is pretty dingy. And, of course, it needs to be rewired. I've never rewired a light before, but this one seems to be easy (unless I'm missing something big). I think there is a light shop across town that has cloth wiring. The hope is to get this light hanging in my bedroom shortly, so I can sell the wonderful Home Depot light in there now on Craigslist. Ugh. Drove by a dumpster not far from my house and spied a house worth of vintage windows laying there. The house was sporting some new, glaring white, vinyl, replacement windows. Charmless. And so the 10 year replacement cycle begins. I wish people knew the vintage windows were built to be restored. A couple of people commented on my last post asking if the heat register cover was original to my house. I thought I'd answer them in a separate post. Yes, the register cover is vintage. Yes, I believe it is originally from my house. First I must tell you that both my bathroom and my upstairs were "updated" by a flipper before I bought the place. 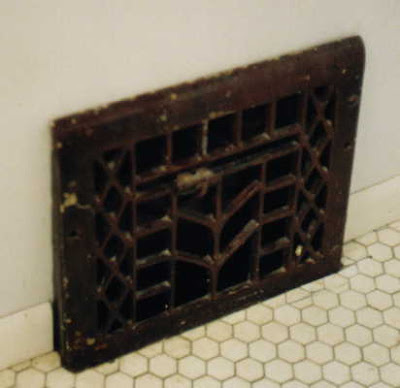 This grate is old, but you could tell it wasn't original to the bathroom because it was screwed flat against the wall. By shadows on the bathroom hex floor tile, you could see that the original grate had rested on the floor. So, one day I was goofing off upstairs and for some reason looked at the register cover on the wall. Something about it was "off." I took a closer look and realized that the vent screwed on the a register hole in the wall was originally meant to rest on the floor. Off came the vent cover upstairs and it was brought to the bathroom. The bathroom vent cover went upstairs. I have no idea if those were their original spots, but they both now fit perfectly. The vent cover that is now in my bathroom was painted an ugly brown when I bought the house. I stripped off that paint and discovered a chromed plated vent cover in poor condition. I then had that rechromed (with a final coat in nickel)...and thats the vent you see in my bathroom today. A little work that paid off. Well, here's the new pink bathroom. I didn't realize what a nightmare painting a bathroom is. Lots of little nooks and crannies. It also dawned on me just as I started that I would need to prime the blue so it didn't show through the pink. Loads of fun. It took me most of the day and well into the night (with brief breaks to whine and watch Super Bowl commercials). At about 1:30am I hit a wall and briefly understood why people just paint over hardware and light bases instead of removing them. There is still plenty to do in the bathroom, but at least it is now pink (see the paint chip that has been taped to my wall since the week I moved into the house). The color is hard to capture on camera, but the photo with the shower curtain is closest to reality. Football is not my thing. I don't hate it. I guess I'm football neutral. The plan today is to turn on the game (maybe) and paint my bathroom. I have plans to add tile to my bathroom walls, replace the horrid medicine cabinet and install a vintage sink. All items have been purchased and are currently stored in my basement (or hallway). Painting should probably be done last. That said, I am in the mood to paint. So, the agenda today includes painting the current light blue walls pink. I can hear every man out there sighing heavily right now. Tough. I want a pink bathroom. This photo is not in the best focus, but it shows the current color better than the others I took. I stripped and painted the window woodwork a year or so ago (I start to forget). More photos once it is pink.